SHERLOC, one of the instruments on the Mars 2020 rover, was cleared to stay on the mission after a termination review earlier this year delayed by the partial government shutdown. WASHINGTON — The five-week partial government shutdown earlier this year that delayed elements of other NASA missions may have provided a reprieve of sorts for a troubled instrument on the agency's next Mars mission. 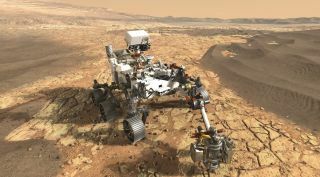 During a March 27 presentation to the National Academies' Committee on Astrobiology and Planetary Science here, Ken Farley, project scientist for the Mars 2020 rover, said that NASA directed the mission last December to conduct a "termination/continuation" review for Scanning Habitable Environments with Raman & Luminescence for Organics & Chemicals (SHERLOC), one of the instruments on the rover. "It had a combination of technical challenges and high cost risk, meaning that it wasn't clear yet what exactly the instrument was supposed to cost because there were technical challenges that had not yet been overcome," he said. That review was originally scheduled for early January, he said, but was delayed by the five-week partial government shutdown that started Dec. 22, curtailing all but essential agency activities. The review eventually took place in late January and early February, after the shutdown ended. "We had actually been able to make a fair bit of progress on solving some of the technical challenges" during that time, Farley said. After the review, NASA leadership directed the mission to continue developing SHERLOC with "relatively minor modifications to the procedures that are used to minimize further cost growth and to minimize the schedule risk." Farley added that the mission looked for "descopes" to the instrument that would reduce its capabilities but also lower its technical risk and cost. "Basically, there was nothing obvious that could be done," he said. The instrument, mounted on the rover's arm, carries a set of spectrometers, a camera and a laser to study Martian rocks. Scientists plan to use the instrument to look for minerals or organic material that could be evidence of past Martian life. Farley, speaking the committee by telecon, that the laser spectrometer component of the instrument is scheduled for delivery to the Jet Propulsion Laboratory in this summer for integration onto the spacecraft. There are backup plans, though, including allowing the instrument to be installed on the rover after it is shipped to Cape Canaveral, Florida, next January for a July 2020 launch. He didn't elaborate on the details of the instrument problem but said it had to do with a high-voltage power supply for its laser. "If I could convey one message to the science community, it is to think deeply about high-voltage power supplies on Mars, because they have been a real problem for us," he said. "Mars is a terrible environment for such voltages, so we have trouble with arcing." SHERLOC was one of the reasons cited by NASA for the mission's cost overrun. The agency, in its full fiscal year 2020 budget request March 18, said problems with another instrument, Planetary Instrument for X-ray Lithochemistry, as well as the rover's sample caching system, caused the cost growth for the mission. NASA has not provided further details on that cost growth. During a NASA town hall meeting at the 50th Lunar and Planetary Science Conference March 18, Lori Glaze, director of NASA's planetary science division, said the cost growth was less than 15 percent of the overall cost — $2.1 billion plus $300 million for its first Martian year of operations — and that the costs would largely come out of other parts of the overall Mars program. The agency's fiscal year 2019 operating plan, yet to be released, will contain details of those costs. Other aspects of the mission are faring well. The heat shield that will protect the rover during entry into the Martian atmosphere had to be rebuilt after the original unit cracked during testing last year. "The new build in on schedule," he said, and is scheduled for delivery this summer. Mechanical actuators for various parts of the rover, components that caused problems for the development of the Curiosity rover, have all been delivered to JPL. A key part of the Mars 2020 mission will be to cache samples of Martian rocks and soil for return to Earth by future missions. As planning begins for those future missions, Farley said there's some reconsideration about what Mars 2020 will do with those samples. Previous planning called for the rover to leave the sample canisters on the surface as it roved, requiring a future mission to pick them up with its own rover. Farley said that the mission is now thinking of going back to its original plans to carry the cached samples on the rover. "We are having interactions with the group of people that are thinking about how to actually do that," he said of planning for collecting and returning samples. "In particular, how can Mars 2020 best handle its sample cache? Is it best to leave them in one place, or in multiple places, or to have the samples on board and potentially participate in a handoff?" Farely added there's no urgency in selecting a method for caching samples. "The beauty of this design is that none of that matters now, because the hardware is capable of doing any combination of carrying everything or putting everything on the ground or splitting it up," he said. "We don't have to commit one way or another basically until the moment when we either put them down or we don't when we're on Mars."